HowToRepairGuide.com: How to remove power antenna motor for radio on Nissan Maxima? 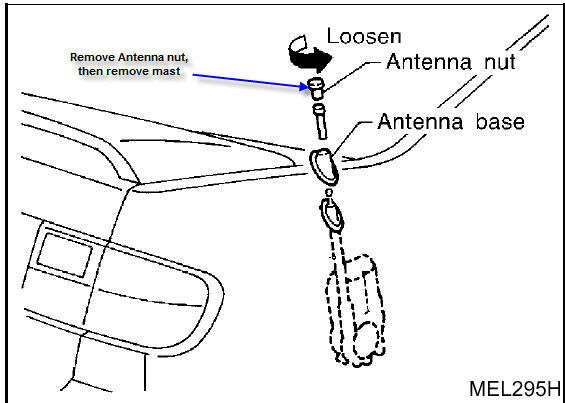 How to remove power antenna motor for radio on Nissan Maxima? To remove the motor, you need to remove the jack, and the right side trunk lining. Then there is a two 10 mm bolts holding the mounting of the motor, the antenna cable, the electrical connector and last but not least, on the bottom of the motor there is a clear hose. That is the drain for any moisture that may seep down into the motor. Once you have all that out, and the motor out of the car, just remove the one side cover of the motor to access the cable to remove it. The internal cable that controls the mast .Try to remove the antenna mast retaining nut and try to remove the mast. What will most likely happen is that you need to remove the antenna motor and open it up to get the broken piece of antenna mast cable out of the motor so you can feed the new mast cable in. Labels: How to remove power antenna motor for radio on Nissan Maxima.